Chad's Steering Damper Mount for the Xtrig PHDS bar mount system. The innovative new bar mount is designed to absorb the vibration from the motorcycle to the riders hands. To date, nobody has had a way to mount a Scott or Ohlin steering damper to the top of the PHDS bar mount system. The Chad’s Steering Damper Mount allows the rider to enjoy the full benefits of the PHDS system and the advantage of the damper for fast open track riding (e.g. Safari, Finke, Gascoyne Dash etc.). There is also the added advantage of keeping the bars low which allows for better cornering in tighter track conditions. 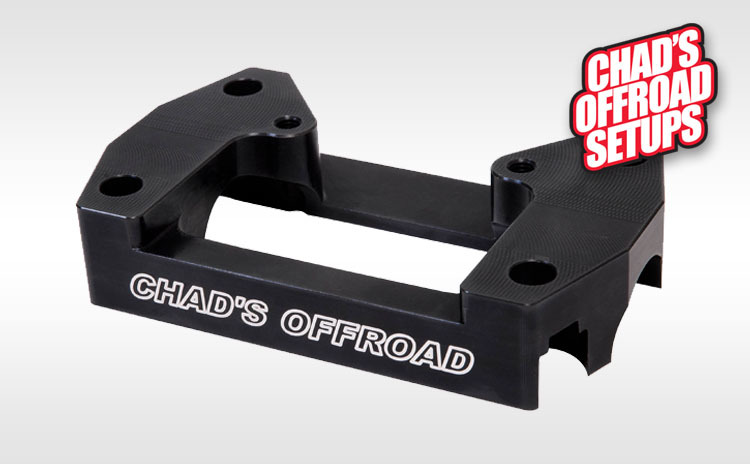 The mount is machined out of billet alloy and finished in anodised black.